Irish which is also called Irish Gaelic refers to the Goidelic language used by the Indo-European language which mainly originates from Ireland. Irish people are the ones who historically speak this language. A minority of the Irish populace now speaks it as their first language. It is now also spoken by a larger Irish population as their second language. What makes the Irish language remarkable is its constitutional status as the Ireland Republic’s first official and national language. It is also known as part of the official languages used in European Union while being officially recognized as one of Northern Ireland’s minority languages. Based on the recorded history of the Irish populace, the language is considered as predominant. Irish people took their Gaelic speech to different countries including Isle of Maine and Scotland. This gave birth to Manx and Scottish Gaelic. In all of Western Europe, the language is said to come with the oldest literature in vernacular form. It should also be noted that there are numerous traditional dialects that represent the Irish language. The phonology and grammar in its different varieties are mainly influenced by English and traditional Irish. Major differences from one dialect to another can actually be seen through their structural features, vocabulary, stress and intonation. 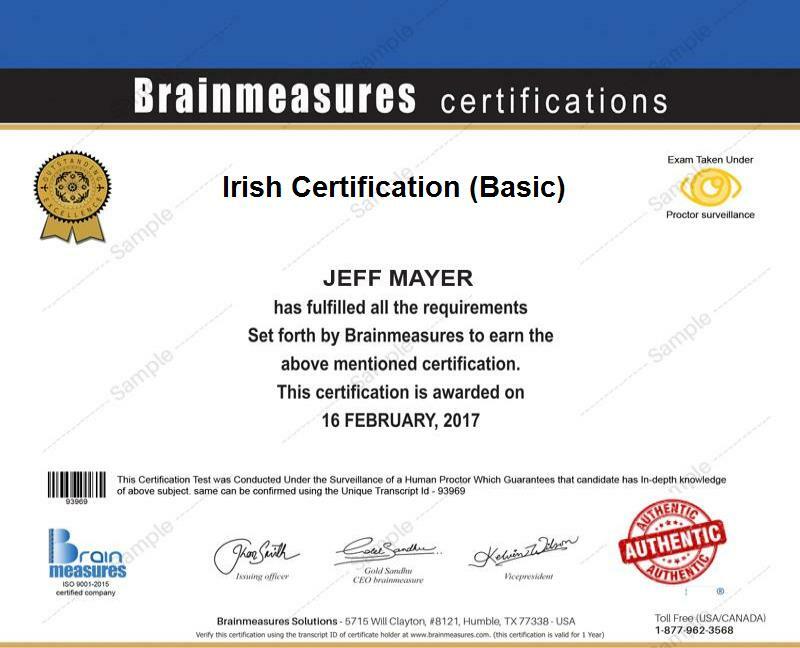 The Irish certification program which is now easily accessible at Brainmeasures is the most suitable online certification course for you if your dream is to become proficient in speaking and writing the Irish language. What makes the Irish course from Brainmeasures unique and remarkable is that it contains everything that you want to learn about the basic Irish language and the manner through which you can correctly speak and write it. With the availability of its well-developed Irish training, you get the chance to master everything about the Irish language, its history, the basic rules associated to speaking and writing it, grammatical rules, basics of structuring a decent Irish sentence, its different dialects, how to effectively deal with people who speak the language and any other essential elements of the language including its intonation, stress and structural features. Holding a copy of an Irish certificate is proven to be really useful in maximizing your knowledge about this popular and impressive language. It allows you to easily handle an Irish to English course and conveniently learn basic Irish. How to introduce people through the Irish language? How to properly welcome a guest in a house in Irish? How to effectively describe people using the language? Anyone who wishes to become a certified professional and expert in the Irish language can take part in the Irish certification program offered by Brainmeasures to the public. It caters to the needs of those who wish to learn more about basic Irish to further impress potential employers with their multilingual skills, visit Irish places without worrying about being unable to understand their language and increase the level of their understanding about the different dialects and variations of this popular language. Finishing up an Irish certification course is also a major help in maximizing your earnings. Upon receiving your Irish certification, you can start applying for the position of an Irish language instructor and start earning approximately $55,000 per year after getting hired. Working as an Irish linguist is also beneficial because it enhances the level of your salary until it reaches around $87,000 on average annually.